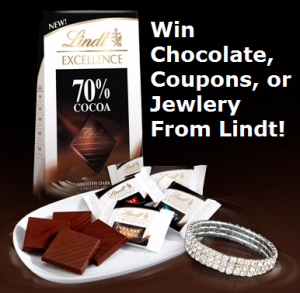 Home > Sweepstakes > Sweepstakes | Chocolate, Coupons, & Jewelry From Lindt + More! Sweepstakes | Chocolate, Coupons, & Jewelry From Lindt + More! There are a ton of great prizes up for grabs this week. The one that sticks out to me is the Lindt Diamonds Chocolate giveaway. Prizes range from Lindt coupons and products to a $3,500 gift card to Ross-Simons Jewlers! $2,500 Visa Gift Card from Ace when you share your best “Champion Story”. First 10,00 entries get a FREE Ace Bandage.